Discover the secret to exciting new ways how to roast marshmallow and have much more fun and safeness! Yes, at last, no more burned marshmallows and dangerous of being near to any fireplace! Bad experience with storing bulky and heavy stuff? Varnished wooden handgrips reveal designs characteristic of quality natural wood and will never overheat. Stainless steel forks with blunt spikes are pretty sturdy. These top quality marshmallow roasting sticks are less bulky than others in the marketplace and won't get easily stained or dirty as other roasting sticks. FREE red zipper travel pouch. You will never loose your equipment. It was designed to be easily recognized. The pouch is heat-resistant. FREE marshmallow recipes ebook. The absolutely best way to improve your culinary ideas! PREMIUM SMORES KIT and 100% SATISFACTION GUARANTEE! Red Storage bag is very handy and can keep the rest of your camping stuff from getting dirty or sticky. Smores skewers are sturdy enough to hold hot dogs or sausages for roasting. 32 Inch length allows for a nice slow roast for the perfect golden brown marshmallows. Forks fit 2 marshmallows quite well. Color coding - choose the colour you love! 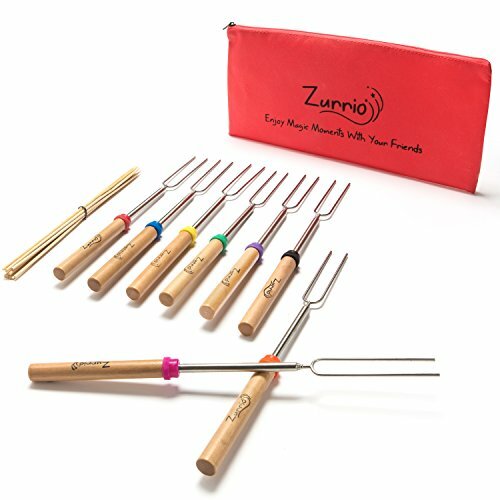 Bamboo skewers bundle for bbq supplies. SAFE FOR KIDS! Our premium roasting sticks give you 32 Inches long telescopic stainless steel rod, which will keep your children a safe distance from any patio fire pit, bonfire pit, backyard fire pit, or campfire. Blunt prongs are the best way how to avoid injury. Varnished Handgrips will last longer and they are made from natural wood material - It will never overheat. If you have any questions about this product by Zurrio, contact us by completing and submitting the form below. If you are looking for a specif part number, please include it with your message.